Both Thomas and Charlie love watching cartoons on television and so having toys that are associated with the programmes are a big plus. Winnie the Pooh has been a family friend for years and both boys love it too. I find that it's a great bedtime cartoon as it's settling and helps the boys relax before bed. We were sent some of the new Winnie the Pooh range from TOMY to review that are great for young children, probably for ones aged around the same as Charlie. I couldn't wait to get them out and get playing, for Charlie of course (I'm a big kid at heart). TOMY have always been known for great quality toys that last forever so I was keen to see if the products still live up to their reputation. A super soft plush toy that is perfectly sized for babies to cuddle at around 10inches tall. Whilst Pooh is being cuddled his cheeks glow red and if you press his nose, 5 different lullabies play to sooth children off to sleep. Pooh even snores and yawns ready for his bed in his night shirt and sleeping hat. The soft glow nightlight can be used with or without the lullabies to help baby sleep and give a little glow into the room. It has an automatic timer which can be set to 10 or 20 minutes so once baby has drifted off to sleep, the toy will turn itself off and not play all night. Both boys love this and actually fight over who gets to cuddle him first, Charlie usually wins after squawking at Thomas and will gently and lovingly cuddle Pooh until he eventually drifts off. The fact that you can set the timer is a big plus as it means that I don't have to go into Charlie's bedroom to turn it off. This is such a simple toy but Charlie really loves it. 9 little plaques that all flip over to reveal different pictures. The little handles are perfect for small hands and the simplicity of it means that it is perfect for young children and babies. Charlie loves to just flick the plaques over and find each character, giggling as he does it whereas Thomas flips them over and tries to match all the colours of each, naming each character as he goes. I find that this is a great toy for playing memory games. We try to guess what character is coming next, see whether we can remember where each is and see who can get all the colours to match up the quickest. This toy is based on the fact that Tigger loves bouncing hence the name of the toy. He is a soft plush but contains a capsule inside him 'where the magic happens' and when switched on he will play soft sounds and make 'boing boing' jumping noises. The boys like to throw him to each other and hear the noises he makes whilst flying through the air but also, Charlie just loves sitting with him to see how fast he can get Tigger to bounce. One of the best things is that Tigger is machine washable. The capsule inside can be taken out so everything electrical is removed and so can be washed. this is great because plush toys never stay clean too long in our house. Just to be sure that it washes ok, I gave it a try. I was so glad when it came out fully intact and wasn't in pieces around my washing machine. The toy washes great and the colours haven't faded and are still bold and bright. Check out our video to see them all in action. Note: I have a very strong Yorkshire accent so be warned! As you can see, we thoroughly enjoyed playing testing out these toys and getting to grips with them. Charlie and I give the Winnie the Pooh range a thumbs up for quality and excitement, great for younger children and for imaginative play. The Winnie the Pooh range can be purchased from all good retailers. You can follow TOMY on Facebook and on Twitter for all updates about their new and upcoming toy ranges. Bringing up children can be all money, money, money but it doesn't have to be. You don't need to pop to all these fancy play centres that charge a fortune to get into and in the gorgeous summer weather, why would you want to be stuck inside anyway? Our local park is a small one but just the right size for the kids. It doesn't get that busy and so many days when Thomas finishes nursery, we will pop up there for a bit and have a play. 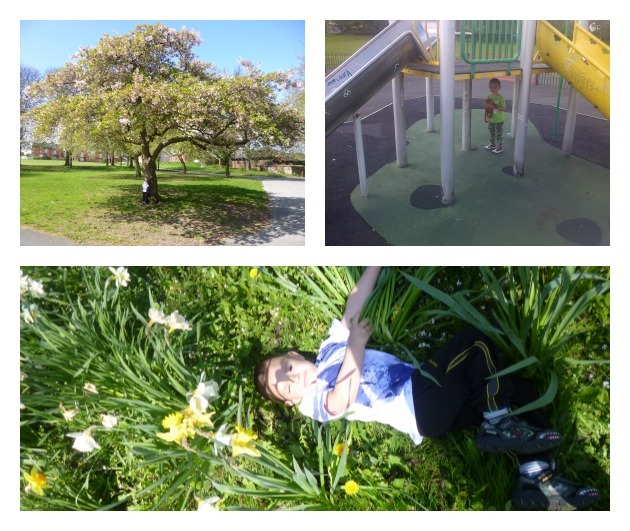 It's a great place for the boys to run off a bit of their energy and just to have a play. With everything we need there to have a good day, it's lots of fun, even mummy gets to have a go! 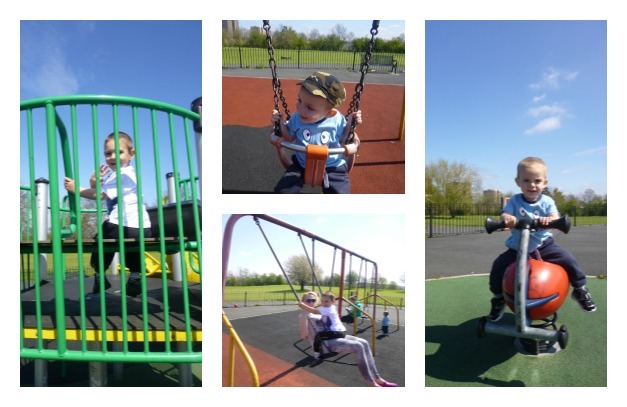 The swing is so much better when mummies on it to make sure we go high, high, higher right up to the sky. 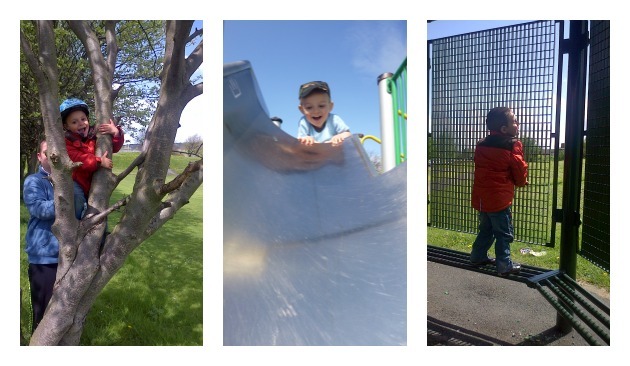 The fact that everything is child friendly makes going to the park a great day out, the children get to run around as much as they like and I can play on the swings read on my Blackberry Playbook whilst they are there. The park has a metal fence around it so he kids can't go wondering off anywhere and are always within a safe distance to me. For a boy though, what's more fun than getting daddy to help you climb a tree. The best feeling in the world, when you get to a big branch and can stand on top of it looking down to see how far you have come up. Having a go on the slide or even just shouting through the railings to friends playing nearby. It's great at this time of year to see all the blossom growing on the trees. I like it when there's a little breeze and we get all the blossom falling around us, makes it feel so magical. After explaining to Thomas that when the blossom falls, we get to make wishes, he popped over to the tree to thank it and to make sure it heard his wish. You know it's summer time when the daffodils are in full bloom and I love the photo of Thomas laid by the side of them. We made sure we were extra special whilst walking near so that we didn't damage any. 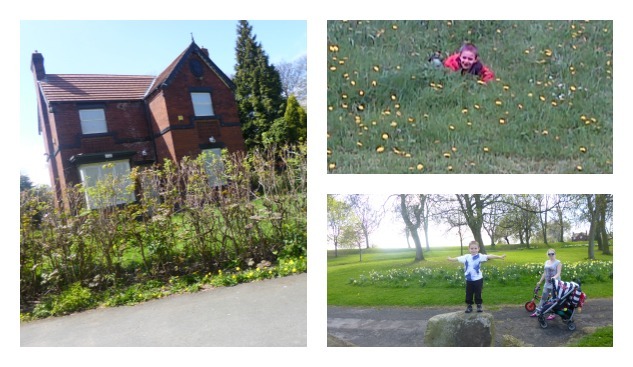 Even just rolling down a hill or climbing on huge rocks can be fun when you are 4 year old. For us though, this house, the park house, is our ideal place to live. I love it! No one lives there now and it has all been boarded up. Such a shame because it is such a lovely house right on the side of the park and would be perfect for someone to do up and live in, preferably me! So don't despair in the summer holidays, which we seem to be flying towards, don't worry if you are short on money and don't have any means of travel. Try your local park for fun ways to get out and about. You can even book small events to go to that are either cheap in cost or free to watch such as the Propaganda Exhibition which is free for children and under 18s. Showing how posters, films, cartoons, sounds and texts are really the state trying to influence us. A full exhibit of different types of media which is definitely going to get the brain ticking. Kids don't need flashy presents and expensive places to travel to, anyway who wants to be sat in a car for hours on end. They just want to have fun and be outside so make it fun in the sun out at your local park. 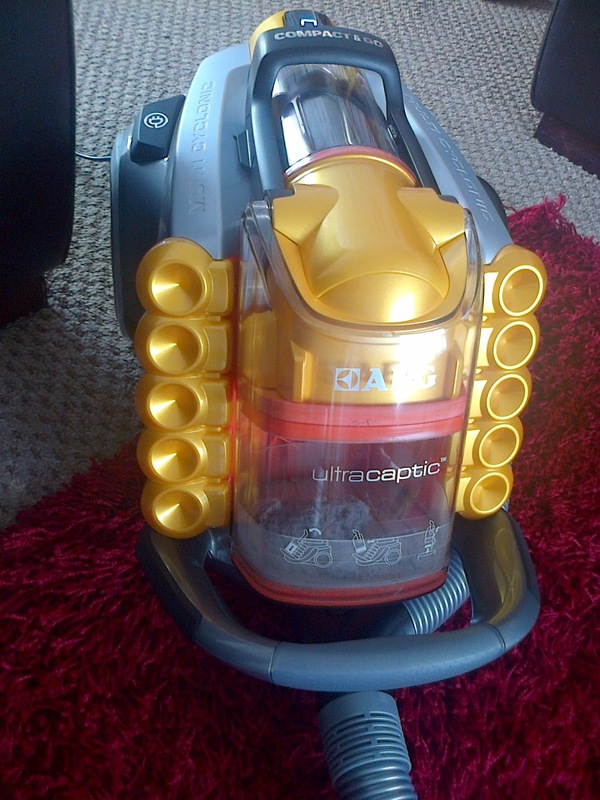 I love cleaning and so when were sent the AEG UltraCaptic Ucanimal to review, I couldn't wait to try it out. With powerful cleaning, easier emptying and an HEPA 13 allergy filter, I wanted to know whether it did really pick up better than any other I've used before. My first post about the AEG UltraCaptic Ucanimal is it's specification. All the things that have been improved or added to make it an exceptional cleaning tool for all flooring types. Even great for allergy sufferers and pet lovers. I love this new function, the Compact & Go, whereby you compact the dust before emptying it. This, in turn, is supposed to make disposal easier with no dust floating away in the breeze. When you compact the dust it also means that you have more space and can vacuum longer before needing to empty it. This filter catches even the smallest of particles leaving nothing but fresh air. This is a great aspect, especially if someone in the family suffers from allergies. Not only that but the filter is washable. The AeroPro Silent nozzle is made for powerful cleaning of different surfaces and has a powerful suction to ensure quick results. The nozzle has three functions, a crevice nozzle, brush and an upholstery nozzle all in one. With both vertical and horizontal storage options and both ways having a stand for the handle, it makes for easy storage which ever way you choose. Clear digital LED display which indicates the power setting which is being used from 1 (low power) to 5 (high power). 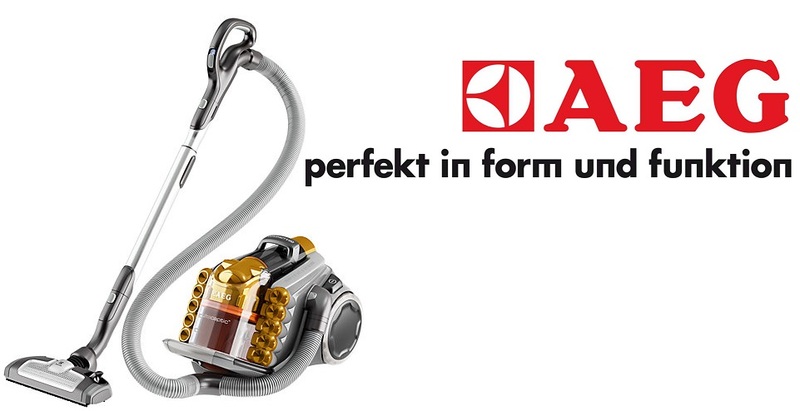 Over the next few week, I'm going to be trying out every aspect of the AEG UltraCaptic Ucanimal and will be posting about how I got on with it, what I liked about it, didn't like about it, how it worked for us and whether it helped us with speed, cleanliness and dust particles. I just want to say happy Fathers Day to you. 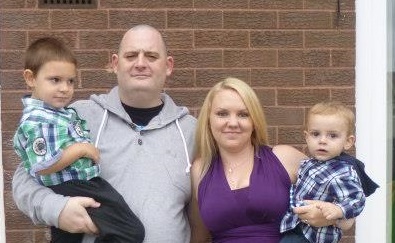 You are a great dad to our 2 boys and we could not function properly without you. Always making sure the kids have everything and even losing out yourself to put them first. You have always been there when I, when we, needed you. Always putting all of your children first and making sacrifices to make sure that we never went without. You are, and always will be, the best Father in the world and I am so glad that I grew up with you as my dad. Remember this day is about you, spent it with your children, whether they are young or grown up. You cherish them yes, but don't forget about yourself. Today is about you! When I was asked if I wanted to review a perfume from Fragrance Direct, I was in 2 minds. Yes, every girl loves perfume and smelling nice but for me, it's a bit hit and miss whether the scent will give me a blazing headache, leaving me ill. After a bit of thought, I decided to give it a try. After all, if it means getting to try a new product and seeing whether I can use it, then that must be a good thing, right? They agreed to send me Yves Saint Laurent Rive Gauche Eau de Toilette Spray which comes in 100ml. YSL Rive Gauche is a vibrant perfume named after the left bank of the River Seine in Paris. It's different from a normal perfume as it comes in a metal tin rather than a glass bottle, somewhat similar to a deodorant can. At first I was in mixed minds as to whether it was good or tacky but then realised that for mums, like me, this was a great idea. Many times I've taken a bottle of perfume out with me so I can give myself a bit of freshness throughout the day, and after a few hours realising that the glass has broken and the perfume has leaked into everything in my bag meaning everything is ruined, even my bag which is now covered in glass. Luckily, since the YSL fragrance comes in a tin can, this wont happen. The spray itself is also different from regular perfumes. Not really floral or musky at all. I really don't know how to explain it apart from saying that it smells 'clean'. With top notes which include Bergamot, Lemon and Honeysuckle and essences of Ylang-Ylang and Lily of the Valley but for me, the scent of Sandalwood is the most prominent. Not that I mind. I love the scent of sandalwood and think it is a truly gorgeous perfume to wear all day long. Even though this perfume has been around for decades, it is still a very contemporary fragrance which I think will be around for years to come too. 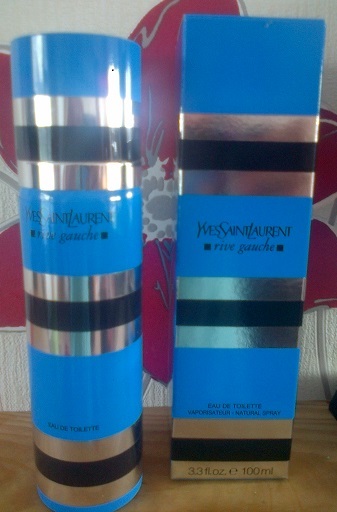 You can purchase YSL Rive Gauche Eau de Toilette Spray from Fragrance Direct here. 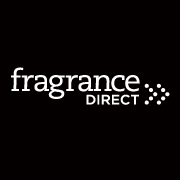 Fragrance Direct can be followed on Facebook and on Twitter. With the summer holidays coming up, we've been trying to think of ways to fill the whole 6 weeks so the boys aren't bored. It is very hard though. Yeah swimming, parks and going to museums can be great fun but not something you want to do every day. So we've kind of got our heart set on a nice last minute holiday to fill up the time. The last holiday abroad that we went on was to Majorca and we loved it. Majorca is one of the Balearic Islands of Spain. 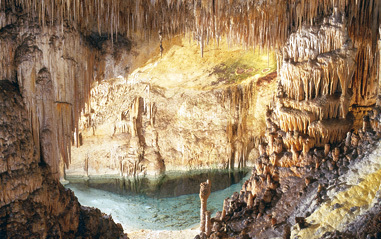 The gorgeous weather attracts most people but the tourist attractions are a big plus too with the Coves del Drach being the most popular. The Coves del Drach is an underground cave which you can go inside to explore. It is known to have one of the biggest subterranean lakes in the world, called Martel Lake. It is truly a beautiful thing to see although I must admit that down in the caves, it does feel very claustrophobic at times. Thomas was only 1 year old when we went and it was hard work. We'd booked a villa and it wasn't very child friendly, the Coves del Drach is a big no no for children and I would advise people not to take children, the humidity is just too much for young ones. That's why we turn to review sites such as Zoover to make sure that the holiday we are taking is suitable for us and the place we are staying in will be adequate to accommodate us. No matter where we go, I'll be sure to check it out thoroughly before booking the holiday and will no doubt be sharing all the pictures with you lot to show you how much of a fab time we had. Nearly everyone I speak to nowadays have suffered with sensitive teeth at some point. Apparently 18.6 million people across the UK suffer from sensitive teeth and one in three of us avoid certain foods to stop the pain and discomfort. That's where Colgate Sensitive Pro-Relief comes in. The exclusive Pro-Argin™ formula in Colgate Sensitive Pro-Relief gives instant relief if the toothpaste is applied directly to a sensitive tooth for around a minute and long lasting protection overall. With regular brushing it will help to fight cavities, strengthen enamel, remove plaque and stains and freshens breath. I get sensitivity intermittently and it is very painful. I find that I often avoid eating cold foods as they seem to cause the most pain. So when I heard about Colgate Sensitive Pro-Relief and their claims, I just had to give it a try. Biting the bullet, so to speak, and jumping straight in there, I decided to do as shown in the television adverts, to rub in a little of the toothpaste onto my gum and tooth where I feel the most sensitivity, and then eat an ice cube. I must admit though, it did help. I did still feel the cold as you'd expect but no pain and no real discomfort. I know that this will be different once actually brushing my teeth as I wont be rubbing into my teeth and gums and eating straight afterwards but I can imagine that over time, my mouth becoming used to the new sensation and the sensitivity easing off. Colgate Sensitive Pro-Relief is available at all major retailers for around the RRP of £3.56. 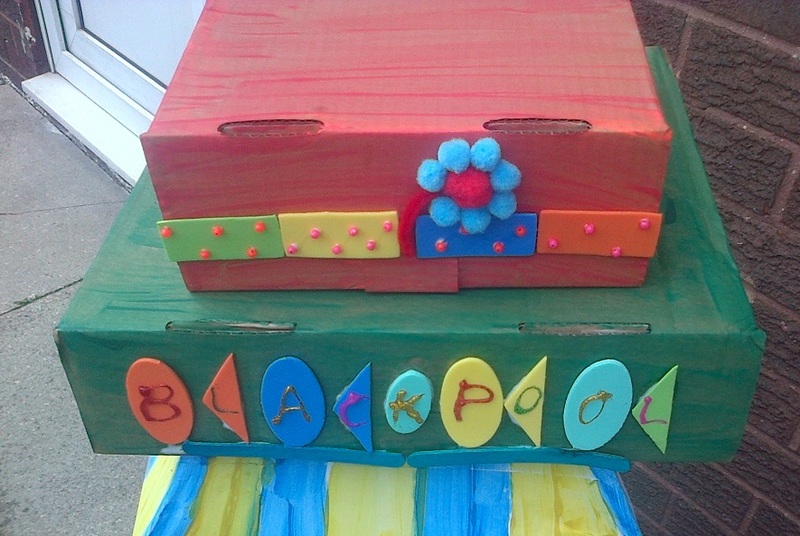 When Tots 100 tweeted about an opportunity they had running with Visit Blackpool, I knew I just had to get involved. The premise was, to build a tower. It could be made from anythin and could be any size, it just needed to be based around Blackpool Tower. So we set to work building a tower, our version of Blackpool Tower. 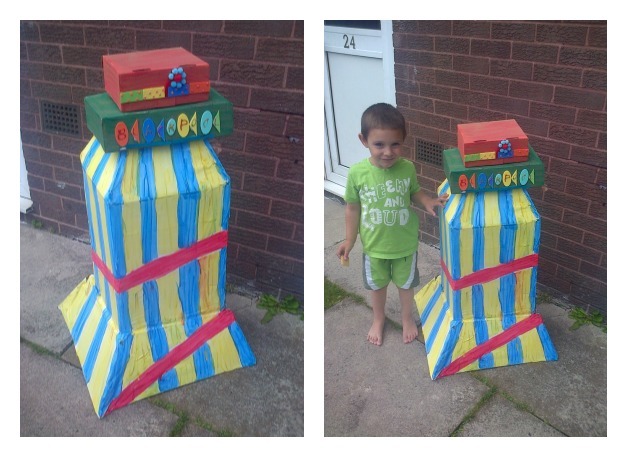 After having a consultation chat with Thomas, we decided that we would base it on a circus theme. Stripes, slides etc and would make it from cardboard, this is mainly because I had just thrown a huge box outside which had Thomas' trampoline in it. We knew that glue would not be strong enough to stick the cardboard together, and I really couldn't be bothered standing to hold it together till it was dry, so we used string to attach the box together. 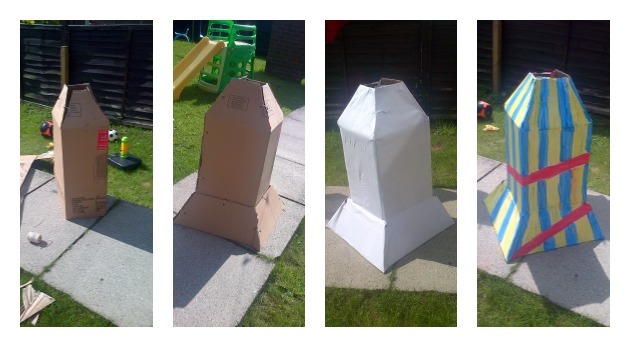 After shaping the top of the box and adding extra bits of cardboard onto the bottom, we started to get our shape. To make painting it easier. Thomas and I covered the whole thing in white paper, gluing it all over to make a solid white base. I then drew the slide on and rough stripes that we could follow and the painting commenced. Realising that the design looked more like a rocket than a tower, we then sort after more bits to make a top for it, like Blackpool Tower itself. 2 more boxes were cut up and stacked on top of the tower and then painted. We stuck on crafty bits and wrote the word 'Blackpool' in glitter. After all it is our version of the Blackpool Tower and Blackpool is the home of the glitz. A flower to make it pretty and a few beads stuck around and the topper was finished. we then set to getting it all put together. A few hours work was put into this tower but I must admit that it was so much fun.